It’s hard to imagine needing a motorcycle to complete what should be such a simple task. I can order medication over the phone and pick it up within a day at my local pharmacy. In the case of a rural African village, the journey to get simple medication or medical attention is quite involved and often impossible. What looks like a basic dirt bike on the outside is truly something special on the inside. The features are considerate and necessary for difficult and often single-track terrains. The dual stand is wide with a large footprint, so it doesn’t sink into soft ground. It has crash bars and stronger skid plates for rough terrain, and sealed brake system and chain covers to keep dirt and water out. It also follows a N-1-2-3-4-5 gear arrangement, which may be more attributed to geographic location of the bike than a safety feature, but still one that I’m sure I’ll slip up on more than once. Aside from the technical aspects of a bike like this, the practicality from a maintenance and finance perspective is huge. The cost of outfitting a health care worker or medical transporter is massively decreased with a smaller vehicle, particularly during larger maintenance projects. 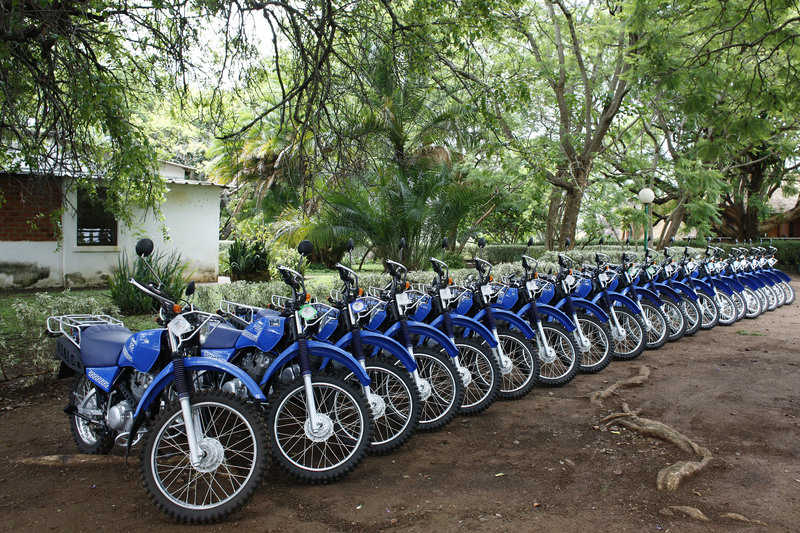 All in all, it’s a no-brainer to use a bike like this when riding through sub-Saharan Africa, especially in relationship to an NGO like Riders for Health. Also, the next time you see one, I’ll be on it!